7:30pm—See Two Time Emmy Award Winning Peter Pan at the Pantages Theatre in Hollywood: Tony Award® nominee Cathy Rigby takes flight in this all new production filled with timeless magical moments and a captivating hook. 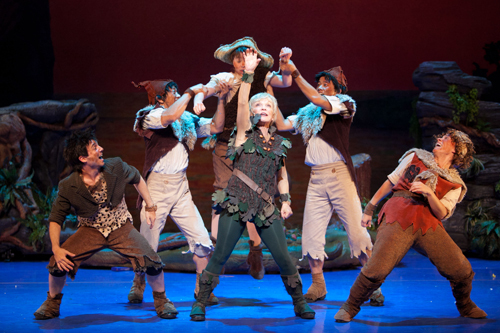 The legend you thought you know, is now the adventure you never dreamed possible…Cathy Rigby is PETER PAN! Recommended ages 4 and up. The Pantages is located at 6233 Hollywood Blvd, LA 90028. For ticket prices and information, go online to BroadwayLA.org or Ticketmaster.com. Hundreds of Los Angeles residents turned out for a public hearing yesterday on the proposed Wyvernwood Garden Apartment complex redevelopment project, which if approved would demolish a World War II-era apartment community in Boyle Heights and replace it with high-rise apartments and condominiums. The Los Angeles Advisory Agency—composed of the city’s Building and Safety, Bureau of Engineering, Bureau of Sanitation, Transportation and Fire department heads— met Wednesday to discuss whether they should recommend approval of the Final Environmental Impact Report (EIR), an analysis of potential significant environmental effects as required under the California Environmental Quality Act (CEQA), and a tract map for subdividing the Wyvernwood property, submitted by the property’s owners, Fifteen Group Land & Development to the City Planning Commission, according to Ibarra. Public testimony lasted most of the day, with pleas for and against the project, Ibarra told EGP. Hearing Officer Kevin Jones collected the testimony for the planning commission. No action was taken at the meeting, Ibarra said. The mixed-use redevelopment project seeks to demolish and replace 1,187 apartment units, located on 70 acres just off East Olympic Boulevard with 4,400 rental units and condominiums in several new buildings as tall as 18 stories. Opponents to the project have cited increased density in an already dense community, the demolition of an entire community, not just buildings, and increased rental prices as some of the reasons for their opposition. Los Angeles Councilman Jose Huizar, who represents the neighborhood, has in the past said he opposes the redevelopment project primarily on the grounds that it will increase density in the neighborhood just east of downtown Los Angeles. Proponents of “The New Wyvernwood,” however, cite modernization and beautification, public safety and job creations among the reasons they support the project. Appeals to a decision recommending approval or disapproval of either the Final EIR or tract map could delay the project’s approval timeline, which is expected to go before the full City Planning Commission (CPC) this spring. The Commission could hold another public hearing if there are any appeals on the track map, before sending a recommendation on the project to the full Los Angeles City Council, which will make the final decision. The $2 billion mixed-use project is getting big support from labor unions, and they were among those speaking in favor of the proposal at yesterday’s meeting. Earlier this week, Fifteen Group announced it had reached a project labor agreement (PLA) with the Los Angeles/Orange Counties Building and Construction Trades Council for work on the project. The redevelopment project is expected to create more than 10,000 construction-related jobs, paying approximately $923 million in wages, and generating an estimated $25 million in annual tax revenue at completion, according to Fifteen Group. As part of the developer’s Boyle Heights Jobs Collaborative, 30 percent of all construction jobs are supposed to go to Wyvernwood and Boyle Heights area residents. The program is modeled after the PVJOBS program that has been in place in the Playa Vista community for more than a decade, the company said in press release. The company also boasts creating a Resident Retention Plan to keep and transition current residents who are in good standing to newer buildings during the several phases of construction. Current tenants could also opt to apply for the city’s relocation payment of $18,650 toward the purchase of a new condominium, according to Fifteen Group. A $1.4 million donation of tools and equipment to Los Angeles Unified School District’s (LAUSD) Division of Adult and Career Education was announced yesterday. Harbor Freight Tools, a local tool company, made the announcement at the East Los Angeles Skills Center in Lincoln Heights. According to LAUSD, more than 55,000 items will be donated to the trade schools. The school district’s industrial career education instructors compiled the list of wish list of items to be donated from products available in the company’s Pasadena store. The tools and equipment, capable of filling about 15 semi trailer truck-loads, will be used by students in LAUSD’s air conditioning repair, electronics, plumbing, construction work and many other field programs. Four adults and two children were injured Tuesday in a head-on collision in the Lincoln Heights area between an SUV and a compact sedan. The crash occurred around 1:20 p.m. in the 3800 block of North Broadway, according to the Los Angeles Fire Department. KCAL9 reported that one of the injured adults was a woman who is eight months pregnant. All six patients were hospitalized. Their injuries ranged from minor to serious, according to city fire’s Brian Humphrey. The philanthropic arm of Wal-Mart on Jan. 3 announced $278,000 in grants to 14 nonprofits in Los Angeles County. Well-known Los Angeles-area education and social service organizations such as Union Rescue Mission, L.A.’s Best, Midnight Mission, Homeboy Industries, AltaMed Health Services and Para Los Niños were among the grantees. The grants were part of $918,000 in giving by the Wal-Mart Foundation to 33 California nonprofits. Police have released photos of a man who robbed a market at knifepoint on Christmas Eve in Boyle Heights. The robbery occurred around 10:30 a.m. Dec. 24 at a market in the 600 block of South Breed Street, near East Sixth Street, said Officer Rosario Herrera of the Los Angeles Police Department. The suspect left the store and was last seen riding away on a bicycle, Herrera said. The suspect is 25 to 35 years old, about 5 feet 7 inches tall and weighs about 200 pounds. He was wearing a black ski cap, blue bandana, light blue sweater, blue shorts and black and white shoes. Authorities urged anyone with information to contact Hollenbeck Robbery Detective Miguel Barajas at (323) 342-8991 or (877) LAPD-24-7. The California Supreme Court last week refused to review the case against a former Highland Park resident convicted of murdering two men and leaving their bodies in a car he abandoned on a Pasadena street and then carjacking a woman who tried to fight him off because her puppy was in her car. Manuel Penaloza was convicted in September 2011 of first-degree murder for the execution-style slayings of two of his friends, Francisco Regalado and Joe Malta. Jurors also convicted Penaloza of grand theft of Regalado’s Honda Accord and committing a carjacking after crashing the victim’s vehicle. Penaloza — who is serving two consecutive life prison terms without the possibility of parole plus 62 years and eight months to life— was extradited from Mexico after authorities got a tip that he was hiding in a small town in Guerrero, where he was arrested in August 2009. An increase in emergency room visits for respiratory illnesses caused the Los Angeles County Department of Public Health Tuesday to urge residents to get vaccinated. Emergency room visits for fever, cough and sore throats have been on the rise over the past several weeks, Fielding said. Most cases are caused by viruses other than influenza, but he said flu activity is increasing and expected to get worse over the next few weeks. The flu vaccine takes two weeks to become effective. — those who care for at high-risk, including health care and day care workers. Typical symptoms include fever, sore throat, runny nose and upper respiratory symptoms, headache, fatigue, and muscle or body aches. “Call in sick!” to work or school if you have flu-like symptoms advises a news release from the American College of Emergency Physicians. Doctors suggest it’s one of the best ways to help prevent the spread of this year’s particularly aggressive national flu outbreak. In it’s statement, ACEP said it had surveyed emergency doctors across the country and the doctors recommended that people who are ill should rest at home until they feel better. Drink plenty of liquids, get rest, and if diagnosed early take antiviral medication. Local and state health officials say there are many places where people can get the flu vaccine, which they say is well suited to this year’s strain of influenza. Supermarkets and pharmacies offer low-cost vaccines and individuals without health insurance or a regular doctor can access free flu vaccine clinics operated by the county. Information is available at www.publichealth.lacounty.gov or by calling 211. Influenza accounts for up to 200,000 hospitalizations and an average of 23,607 deaths in the U.S. each year, according to the Centers for Disease Control. At a special meeting Tuesday, the Vernon City Council voted to place three tax measures on the city’s general municipal election ballot in April. The three taxing measures include a business tax, parcel tax and a utility user’s tax. City Administrator Mark Whitworth said at the meeting that the city is proposing the new taxes as a way to address Vernon’s budget deficit. “The city of Vernon has been working on good governance reforms, respecting city budget policies and practices, and we’ve been working diligently in recent years to develop a long term solution for the general fund structural deficit,” Whitworth said. The mostly industrial city, with just 100 or so registered voters, has for years touted its ability to keep costs to businesses operating in the city low. Measure K, a business license tax measure, would make the current tax to business owners five times higher. If passed, estimates are that it will provide the city with an additional $4.5 million in revenue. The new measure would also clarify some of the city’s tax language, and would allow some business licenses to be combined. Businesses that are owned by the same person and are not separated by a public street, for example, would not be subject to a double tax. The city also hopes Measure K makes it more efficient for outside contractors to do business, by changing from annual to quarterly contracts to match how long it usually takes to complete a project in the city. Several business owners at the meeting told council members they oppose the tax, which they claim will make it harder to do business in Vernon. One owner expressed his concern over the wording of the measures, which he said would not accurately represent the impact the tax will have on businesses in the city. The council also voted to ask voters to approve a business parcel tax—Special Tax Measure L—that would levy a 3 cent tax on every square foot of non-residential lots to fund public safety services. The 10-year tax would help fund fire, health and police services through 2023 and is expected to generate $1.9 million, according to city officials. The square footage that businesses are already being taxed through the Warehouse Parcel Tax would be excluded from this new tax. Some members of the audience asked the city council to look into the possibility of outsourcing the city’s public safety services in order to bring down their cost. As for Measures M, the Utility Users Tax, voters will decide if they want to approve a 10-year, 1% tax increase, which could generate $1.6 million for the city. The tax would be applied to water, gas, electricity and telecommunications usage. Originally, the proposed measure excluded residents, but Councilman Ybarra asked the council to amend it to include both residents and businesses in order for them to “share the cost.” The council also added a $250,000 annual cap for taxpayers and excluded low-income households and the disabled from the tax increase, if approved. The city council needed to adopt the resolutions by Jan.11 in order to ensure the measures got on the April 9th ballot. Whitworth told the audience the measures are needed to deal with Vernon’s ongoing budget deficit, which had exceeded $20 million a year going back to the 1970s.